Synopsis: Two veterans of the Bosnian War — one American, one Serbian — find their unlikely friendship turn tense with one of them reveals their true intentions. Thoughts: Y’know, every time that I make up my mind to give Robert De Niro the benefit of the doubt he goes and makes a questionable decision on film choices. De Niro is a well respected actor and is at the point of his career where he can honestly do whatever he wants, kinda like Meryl Streep. The difference is that Streep’s outside of the box choices tend to give the actress the kind of stretch opportunities in unorthodox roles that don’t ultimately ding her past credits. 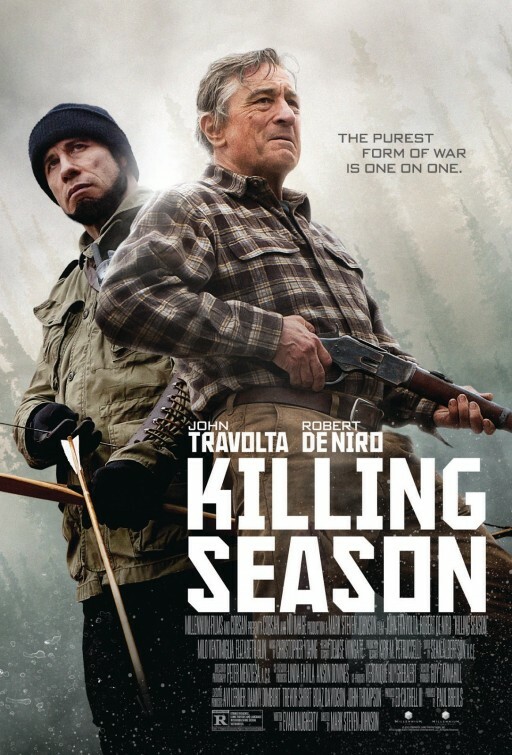 I consider any pairing with John Travolta to be a risky move and Killing Season looks like a gobbling turkey of a survival thriller. I’m not quite sure what’s growing on Travolta’s face or where he pulled his accent from but it doesn’t bode well for us, the moviegoers. De Niro made good with 2012’s Silver Linings Playbook so it’s extra disappointing that his 2013 films (The Big Wedding, The Family, and this) look so bad.